I’m excited and honored to be part of a new blog written by a group of foster moms (and hopefully some other perspectives, too) called Dropping Anchors. I wrote the first post which went live on Saturday, called These Weirdos Are My Tribe. Today there’s an excellent post written by my friend Kate which explains What It Means to Drop Anchors. I’d love for you to check it out and let me know what you think! The wee hours of Saturday morning marked 4 weeks since Buzz joined our household. I’m starting to regain normalcy in many aspects of my life. I’m caught up at work. I got our checkbook balanced a week ago. I worked out our family budget the other day. Bills are getting paid on time. Laundry is getting done. I’m pretty sure we’re no longer receiving meals from friends and generous neighbors. I’ve been keeping up with grocery shopping somewhat. I plan to actually cook some more complicated (than spaghetti) meals this week. I’m showering most days and remembering to feed the dog. The kids (and usually Jason and I) get three meals a day and snacks-o-plenty. There are lots of bums to wipe, booboos to kiss and hugs to give out everyday. We’re getting settled. One thing—appropriately at the bottom of the priority list, I suppose—that has not quite rebounded is blogging. I miss this space to share and process and build community. I realize I need to lower the bar. I’d like to get back to M-F regular posting. I have all these big things going on around me that I want to write long, thoughtful posts about as I unpack it all from my brain…however that takes more time than I can spare just yet. I’m going to try my best to get back into regular posting by keeping them short and sweet. 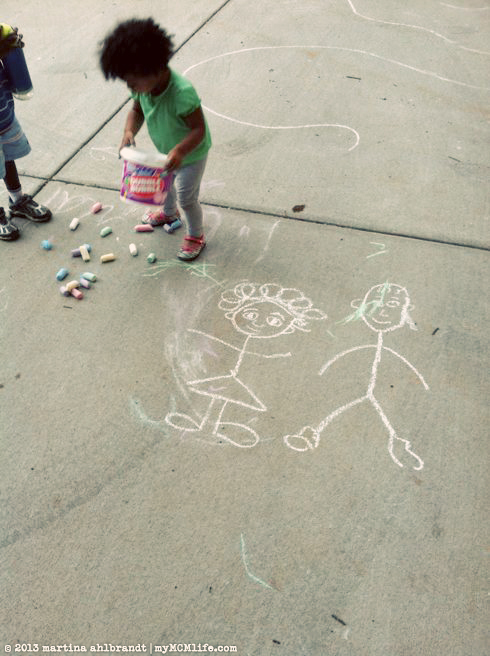 Because, I have a lot of other things to do, like draw chalk people on the driveway with two adorable little toddlers.